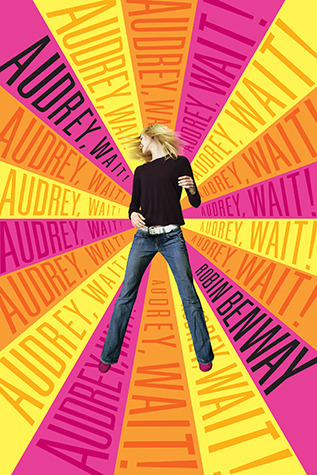 Bookanista Rec :: AUDREY, WAIT! From Goodreads – California high school student Audrey Cuttler dumps self-involved Evan, the lead singer of a little band called The Do-Gooders. Evan writes, “Audrey, Wait!” a break-up song that’s so good it rockets up the billboard charts. And Audrey is suddenly famous! Now rabid fans are invading her school. People is running articles about her arm-warmers. The lead singer of the Lolitas wants her as his muse. (And the Internet is documenting her every move!) Audrey can’t hang out with her best friend or get with her new crush without being mobbed by fans and paparazzi. Take a wild ride with Audrey as she makes headlines, has outrageous amounts of fun, confronts her ex on MTV, and gets the chance to show the world who she really is. The above summary describes Audrey, Wait! as a wild ride, and that’s exactly what it is. I had a blast following along with Audrey’s fast-paced misadventures, and cheering her on through her blunders and bloopers. This book is a perfect mix of fun and heart and substance, and it’s a definite new favorite. See? That’s just a tiny sampling of the awesomeness of this book. Audrey, Wait! is like nothing I’ve read before, and it’s a fantastic example of how absolutely real and relevant young adult literature can be. I highly recommend it!